On behalf of the Executives of Richmond Volleyball we are pleased to invite you to attend the forthcoming AGM. The 2017 AGM will be held at 8.00 pm on Saturday 11th November 2017 at The Gazebo (Upstairs) Kingston Riverside, Kingston Upon Thames, London (Greater), KT1 1PE. Richmond Docklands maintained their 100% record at the start of the new season with an important 3-0 win over Team BU Wessex. After a comfortable away victory in the cup the previous weekend, Richmond Docklands returned to Super8s action with a tricky away tie in Bournemouth. Without two players due to injury and one due to school commitments, Luis Bello’s squad of eight players travelled the short distance down the M3 to face a side who did the double over Docklands last season. With a landmark victory to open the Super8s season over reigning champions IBB Polonia under their belts, Richmond Docklands made it back-to-back debut victories with a three-set victory over Manchester Marvels 2 on Saturday in the Cup. After an off-season fraught with protracted negotiations between London Docklands, one of the most historic clubs in the country, and Richmond Volleyball Club, a rising force in English Volleyball, the debut match of the newly formed Richmond Docklands ended in a dream scenario. 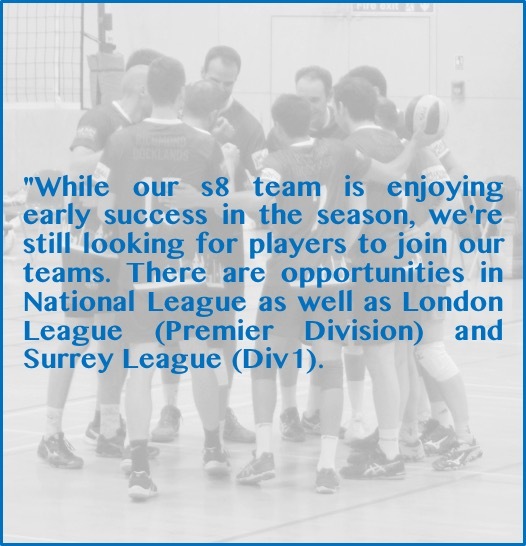 The simple fact that Super 8 volleyball was played on Saturday evening at Kingston College Arena was a significant achievement and testament to the vision and hard work of all involved at both London Docklands and Richmond Volleyball Club.